Indians are inventing ingenious ways to try and hide their money from the tax inspector, as the government attempts to flush out vast undeclared wealth by abolishing high denomination bank notes. 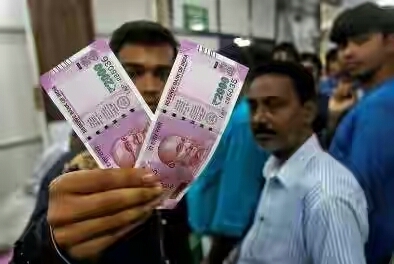 The shock announcement by Prime Minister Narendra Modi on Tuesday gave people only a few hours to spend or deposit 500 and 1,000 rupee bills before they were abolished, although plans are in place to allow a more gradual conversion to new notes. Those plans involve depositing old bills in bank accounts, however, where they can be seen and analysed, and, as millions of Indians scramble to convert savings using this method, some with piles of so-called “black money” are looking for loopholes. Retailers and wedding planners say they have been inundated with frantic calls from people looking to bring forward large-item purchases from anyone willing to accept the old notes. In Mumbai, a senior marketing executive at an event management company that organises large weddings has witnessed the scramble, and said his firm was debating whether to accept payment in the old money. Like many others, he was unwilling to be quoted by name when discussing his customers’ requests. That amount is not unusual for a wealthy Indian family’s wedding celebrations. Others are looking to line up friends, domestic staff, and even senior citizens who are prepared to legally exchange the cash in small enough chunks to avoid scrutiny from banks. Simply stepping forward and declaring the money is not an appealing option for tax dodgers, as banks have to report to tax authorities anybody depositing over 250,000 rupees ($3,765). Being found to be holding undeclared cash can lead to a penalty of 200 percent of the tax owed. Other unusual methods of exchanging cash are appearing on social media. One tweet described how people were paying agents for expensive first-class train tickets with old bills and then cancelling them later to get reimbursed in new notes, all in order to get around the tax man. State-run Indian Railways was one of the few places still allowed to accept the old notes until Friday. Anil Kumar Saxena, spokesman for Indian Railways, said ticket purchases for first class, air-conditioned compartments, the most expensive category, had surged. “We usually sell about 2,000 tickets every day,” he said. The day after the demonetization measures were announced, that rose to 27,000, Saxena added. Officials have caught on to some schemes. The railways will refund tickets worth over 10,000 rupees booked on November 9, 10, and 11, but not in cash. “It will be done by cheque, or electronically,” Saxena said. A jeweller in Mumbai said he stopped accepting cash payments after someone he believed to be a revenue official lingered outside his shop. Jewellers stayed open into the early hours of Wednesday, and one well-placed industry source in Mumbai estimated that about 250 kg of gold, worth an estimated 750 million rupees at spot prices, was sold in the city within a few hours of the ban. The source said jewellers were paid anywhere between 20 and 65 percent above the going rate by buyers snapping up the precious metal with old notes. Meenakshi Goswami, Commissioner of Income Tax, underlined how hard it was for the authorities to detect such activity. “I’m not aware of anything going on,” she told Reuters. SHADY ECONOMY: The problem of the shadow, or “black” economy in India is pernicious. Transactions that take place outside formal channels amounts to around 20 percent of India’s annual $2 trillion gross domestic product, according to investment firm Ambit. Shrinking it is a major objective for Modi, who is trying to get more money into tax coffers. India’s tax revenue as a percentage of its GDP was 16.7 percent in 2016, compared with 25.4 percent in the United States and 30.3 percent in Japan. Macquarie estimated the government could raise $30 billion in additional tax revenues from its scheme to withdraw higher-denominated bills, enough to significantly reduce India’s fiscal deficit, which in the previous year stood at around $80 billion. Modi’s administration also implemented a tax amnesty scheme that brought in nearly $10 billion in undeclared income, while regulators are also trying to target unreported accounts overseas. Bringing money into the legal economy without declaring it is proving tough. A senior citizen in Mumbai with around 500,000 rupees in undeclared cash told Reuters she split up the amount and opened bank accounts for four of her domestic workers. Others say they are asking cousins, employees, and senior citizens for help to exchange the cash in the hope that it attracts less attention. “For smaller sums, there are ways to change the money,” a partner at an investment firm told Reuters.